One big trend seen this season is neon.. But at the same time, another big one is pastels, which is exactly the opposite of neon! 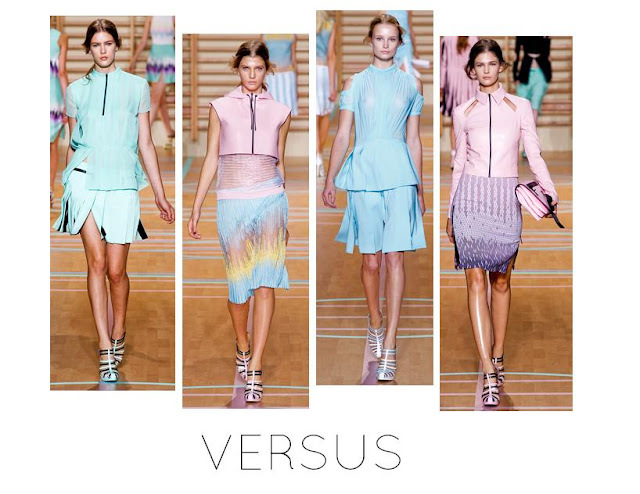 So many shades of pastels, it can get so confusing! Just add white to any pigment color, and there you have - a pastel shade of that particular color. Therefore there can be so many different shades! Lets look at the most common and popular colors.. The names are purely for fun! 1. Floaty sequin dress (houseoffraser.co.uk); 2. Bridget Backpack (monki.com); 3. Snake Print Clutch Bag (oasis-stores.com); 4. J Brand Denim 811 mid-rise twill skinny jeans; 5. CHLOE Turquoise Holly Enamel Bangle; 6. Gurhan Rose Cut Blue Corundum Quartz Earrings; 7. J C Penney Gurhan Rose Cut Blue Corundum Quartz Earrings; 8. Wet Seal Marble Pendant Fringe Necklace; 9. Diane Von Furstenberg Wanata top; 10. Vivienne Westwood Red Label Drape taffeta mini skirt; 11. Sperry Top-Sider Bahama 2-Eye (zappos.com); 12. Destined Nail Color (tillys.com); 13. Alice and Olivia One shoulder drape dress; 14. Love Quotes Linen Tassle Scarf Mustique (austique.com); 15. Ted Rossi Python Bangle: Seafoam; 16. Sienna Volantbluse (conleys.de); 17. Bajra Exclusive Ombre Scarf (intermixonline.com); 18. Pippa Small Aquamarine Greek Ring (astleyclarke.com); 19. Nordstrom Icon Eyewear 'Maureen' Retro Sunglasses; 20. Ted Rossi Python Bangles (Set of 3); 21. Lanvin Two-Tone Minaudiere; 22. Jil Sander Clutch. 1. Monsoon Marcy Top; 2. Marc by Marc Jacobs 'Turnlock - Katie' Large Enamel Bracelet; 3. Dorothy Perkins Yellow espadrilles; 4. Tapers and Spikes" Silver and Gold Chain ID Bracelet (endless.com); 5. Fantoosherie Chiffon Rose Necklace (hannahzakari.co.uk); 6. Kurt Geiger Printed Small Pouch; 7. Lisa Stewart Hammered Marquis Earrings; 8. Vero Moda Very Top Solice Yellow; 9. The Row Yellow Lizard And Ostrich Leather Mini Twin Handbag; 10. Carven Pleated Dress; 11. bag (farfetch.com); 12. Iconic Small Lucite Double Jasmine Flower Post Earrings (tarinatarantino.com); 13. Dorothy Perkins Yellow pastel corsage; 14. Hug a Porcupine Ice Cream Origami Pin (hannahzakari.co.uk); 15. Pastel nail paint (bell.com.pl); 16. Lisa Stewart Hammered Clear CZ Border Tear Drop Earrings; 17. Topshop Fluro Stripe Bralet by Boutique; 18. Dewey Decimal Vintage Card Catalog Brass or Silver Lever Back Earrings (etsy.com); 19. Current Elliott Yellow Neon The Stiletto Jeans; 20. Bloch Patent-leather ballet flats; 21. Repetto BB woven raffia ballet flats; 22. Weekday Sea Swim Brief Yellow. 23. Old Navy Womens Straw Basket Weave Totes; 24. J.Crew Citron sequined silk-crepe mini skirt. 1. Alice by Temperley Tarini embellished silk-chiffon dress; 2. Alexander Wang Brenda Chain Bag in Acqua; 3. Diane von Furstenberg Lytton python-effect leather box clutch; 4. Debenhams turquoise braided rope wedge heeled sandals; 5. Debenhams Turquoise carved flower earrings; 6. Juicy Couture "Endless Summer" Turquoise Glitz Stone Cluster Bangle bracelet; 7. Carvela Lindsey courts; 8. Insight Spearmint Low Rider (generalpants.com.au); 9. Burberry Prorsum Kingfisher bag; 10. Topshop Mint Textured Peplum Skirt; 11. L.K. Bennett Poppy Shoe; 12. Kate Spade New York Kate Spade Chandelier Earrings; 13. Ally Capellinomonroe Turquoise Bag (coggles.com); 14. Rokit Recycled Green Cut Off Denim Shorts W31; 15. Kate Spade Carousel Bangle; 16. Aqua Enamel Printed Hinge Bangle (bloomingdales.com); 17. Dabney Bib Necklace; 18. Danielle Stevens Clear Aqua Chalcedony Initial Charm Bracelet; 19. Miu Miu Shoulder Bag; 20. Essie Nail Color, Turquoise & Caicos; 21. Nessa Peacock Turquoise And Tourmaline Necklace; 22. Green Stripe Beach Shopper (wallisfashion.com); 23. Carvela Kurt Geiger Assemble. So which color are you going to wear? A lovely detailed post! Love how you've put it together! 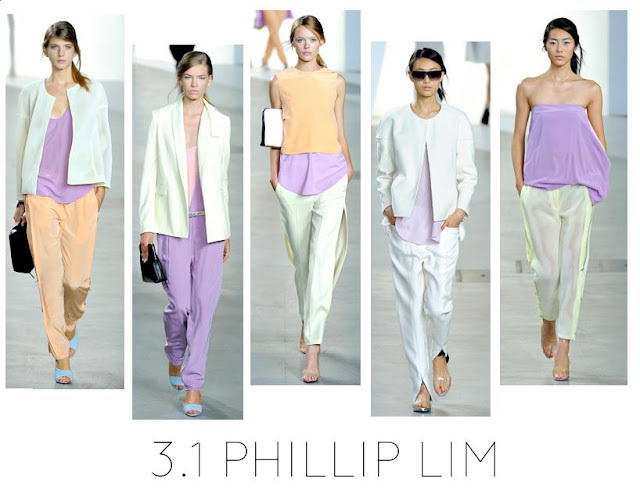 Pastels are such a cute, subtle trend to incorporate into our outfits!